Invite Lama Tsongkhapa's 3-in-1 blessings of wisdom, compassion and skilful means into your life with a Lama Tsongkhapa clay tsa tsa, containing precious herbs, holy items and the blessings of the lineage masters. His image grants many benefits including stabilisation of wealth, healing of depression and sickness, protection from negative energies, enhancement of intelligence, clarity of mind, deep joy and peace. 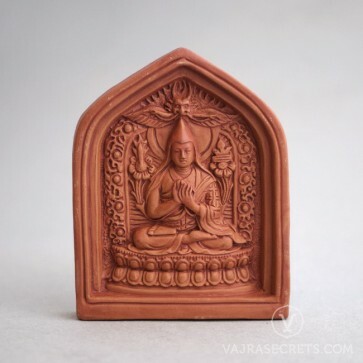 Invite Lama Tsongkhapa's 3-in-1 blessings of wisdom, compassion and skilful means into your life with a Lama Tsongkhapa clay tsa tsa, containing precious herbs, holy items and the blessings of the lineage masters. Perfect for smaller shrines, workstations and portable travel altars. As each tsa tsa is handmade, there may be some variations in colour and texture. Lama Tsongkhapa is an emanation of the Buddhas of Wisdom (Manjushri), Compassion (Chenrezig) and Skilful Means (Vajrapani), and is revered as the single greatest Tibetan commentator, scholar and yogi in the history of Buddhism. Hailed as the "Second Buddha", he was a great enlightened being who founded the Gelug tradition.